“These are… beautiful,” I say with trepidation, inserting a half-question mark at the end of my sentence to see how my comment will land. I am in Alyson Denny’s studio near the East River, looking at some of her photographs pinned to the wall. Denny, a New York based photographer and video artist (and the first in my series of studio visits! ), doesn’t seem to mind. In today’s art world, beautiful is not necessarily a word of praise and is certainly not the modus operandi of many contemporary artists. Are Wolfgang Tillmans’s meticulous installations beautiful? I don’t think that’s the word I’d use to describe them. Anish Kapoor’s Cloud Gate? Not in a conventional sense. And for artists like Cindy Sherman and Jenny Saville, beauty is often the opposite of the point. Beauty with a little "oomph." Alyson Denny, Cabinet Glass Sessions #14, pigmented inkjet print. Throughout my visit I got the distinct impression that Denny was “my type of artist,” innovative as it would serve her art but not for innovation’s own sake, accomplished, yet gentle and kind with me, a novice interviewer, and above all, excited to share her work, generous with her time. Her patience, always with energy behind it, was the setting in which we explored her work, together. Her education in shooting for documentary, however, did leave its mark. The “fly on the wall” approach she was taught as a student had her observe anything and everything as it unfolded in front of the camera. She would then bring the footage back to the studio to “massage” (the verb Denny often uses to evoke her process) her material into the message she ultimately wanted to communicate. This back and forth between “field” and studio is the crux of Denny’s practice, and understanding this tendency to oscillate between the planned and the freewheeling is essential to mining her later works. 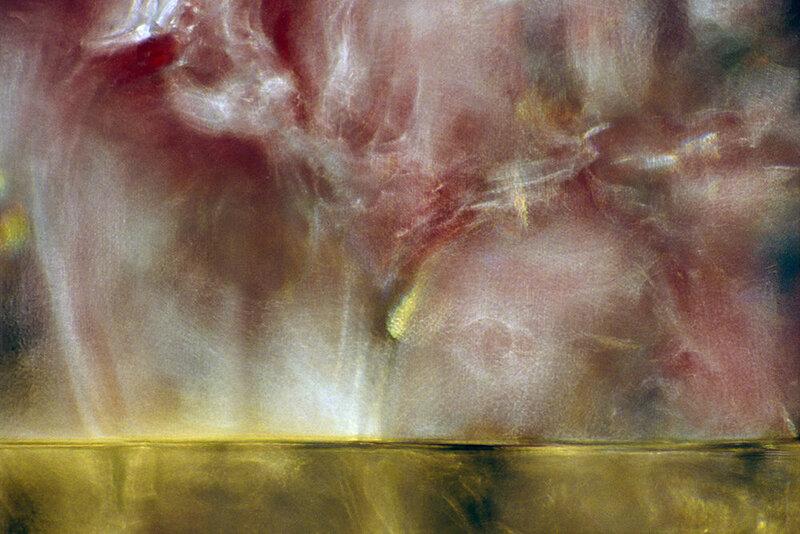 Take the Cabinet Glass Sessions, a series of evocative abstract photographs that for many (including this blogger) resemble the exuberant brushiness of painting– from the works of J.M.W. Turner to the Abstract Expressionists. (Not so off the mark, as Denny does admit that she was raised looking at their monumental paintings, as her father was an art historian). But what is utterly different about these works, which depart from the Surrealist origins of Abstract Expressionism, is the constricted space in which they are free to thrive. While the Abstract Expressionists (I’m thinking particularly of Robert Motherwell and (perhaps) Jackson Pollock) depended on the chance results of artist confronting material, these photographs rely, yes, on what is produced in the moment, but under conditions already predetermined by the artist. Denny is meticulous in finding the right set of rules to govern what images can be produced. She explains: “In my own work I am interested in setting up systems and interacting with them. It’s a long process of setting up the system and then the interacting is very improvised.” For the Sessions, the “system” is one of layering various semi-transparent materials over bold colors. Each layer (antique glass, then a scattering of iridescent beads atop a smearing of hair gel, all over colored gel filters) plays with light in a different way, scattering it to produce a vast array of pictures. In some ways, it’s like playing around with a kaleidoscope, except that the most intriguing and most beautiful prismatic images have been pre-selected for you. Alyson Denny, Cabinet Glass Sessions #11, pigmented inkjet print. My personal favorite- -somehow it reminded me of John Singer Sargent's El Jaleo. Alyson Denny, Cabinet Glass Sessions #19, pigmented inkjet print.